There is no way I’m pregnant. With 2 kids already and 2 jobs, another baby was the last thing on my mind. It must just be stress making me feel this way. But, ok I will take the home test. Positive. Ok, maybe that was wrong lets test again tomorrow to be sure. My heart was racing, my stomach lurching, as the pale, but definitely visible, second line stared back at me from the bathroom countertop. I’m pregnant. Surely this must be a mistake. My youngest is about to be 6 months old (at the time). My first thoughts were for our youngest. How can I possibly give her the attention she needs if I’m distracted by months of morning sickness and worse — a brand new baby? Then our oldest, how can I turn her world upside AGAIN? I was in shock. I didn’t know what to think. Everyone around me was happy, while surprised, when they heard the news. Still, I couldn’t shake the sorrow. Yes, I want more kids in the future, but now? I knew the life growing inside of me was already part of our family. I just needed time to get used to the idea. As time went on, I began to come around to the idea of 3 kids and 2 jobs. As the sickness started to lessen, so did my feelings of anxiety. We would figure out the schedules and the money and all the other details a family with three kids always does. I was even starting to enjoy the idea of three kids running around together making messes, sharing stories and filling our home with giggles. Then at 10 weeks, IT happened. I began to loose the baby. We fought. We fought hard to hold on to this baby. But God had different plans. I had a miscarriage. I felt so guilty. Guilty over not wanting this baby to begin with, guilty for all the times I prayed with bitterness about the pregnancy and afraid that maybe all my negative emotions had caused this little life to leave me. Which is NOT true! A miscarriage cannot be explained sometimes – and even more so in our situation. However, we know God has a better plan. We don’t see it and we might not understand it, but we have to TRUST it. Through the chaos of emotions my body reacted negatively and I ended up spending most of my night in an ER. Thankfully, the LORD was there every step of the process. He gave us the perfect ER Doctor. He lead us right where we needed to be. He allowed the right medical attention given to me at the right time. He designed our bodies so well that my body can heal itself after the past 10 weeks. Our Angel Baby is now sitting at the LORD’s feet. Our Angel Baby now has an even better life than I could ever imagine. Our Angel Baby will never have to worry about sin, temptation or worldly desires. Instead, our Angel Baby will walk the streets of gold and forever worship. Nothing better than knowing your children are with the Father. Still it hurts, but there is peace with the Father. Knowing that God has a perfect plan for our lives gives me an indescribable hope for the future. I think I will always get sad when I look back on this time in our life, but I will continue to rejoice knowing that God works for the good of those who love Him. You could spend your whole life asking why something happened, but you will never have any peace until you give it over to God. His plan and his timing are far better than anything we can imagine for ourselves. I may not understand the situation now, but I know who HOLDS the situation. I may hurt, but I know who HOLDS me. I may be confused, but I know who KNOWS all the answers. Our Angel Baby will forever be apart of our family. Everywhere we turn we are being bombarded by politics. TV. Street signs. Social Media. Billboards. You name it – it’s there. You have one side of people supporting one candidate and others tearing another one down. It is constant. Yes, I know our country is in trouble. Yes, I know what is going on. Yes, I know what is at stake. With all that said…what good is ranting or debating politics? We will have the same outcome whether I chose to “show how human a candidate is” or not. While we sit, debate and follow every step of every candidate we are neglecting the truth. No matter what happens. No matter who represents what party. No matter who is in office come January. No matter how many primaries. No matter what… GOD IS STILL ON THE THRONE! Trust me I worry as much as the next person, however there is a fine line of being educated and knowledgeable and being OF the world. Think about Noah. During his time so much was going on around him. There is no doubt in my mind he knew exactly what was going on in his town. He was educated but he was not OF the world. He did not participate in the worldly things, instead he built an ARK! He sat and quietly listened to the Lord’s voice and obeyed. He would talk to those around him but never condemn them for what choice they made. God knew the world condition at the time of Noah. He knew that He would need someone like Noah to make a difference. Noah saved humanity! Don’t you think that same God knows what is going on here? Don’t you think that same God is calling out to us to make a difference? God has us here and now for such a time as this. God has prepared us to stand on the Gospel of Truth and point people to Christ. Why be of the world when we were called to be NOT of this world? Why get caught up in debates when we can change hearts? Today, I challenge you to take a step back and find out why you are here. Instead of pointing out human error in the candidate, pray for them. America. We need Christians to stand up and LEAD this country. We need to be the salt and light of this world. God has prepared us for such a time as this. No one knows what to say when a doctor utters the unthinkable “C” word. Your mind just stops, sits there and is in complete shock. As humans when we hear “cancer” we forget who is in control. We forget that God has a plan. We forget that it is in His hands. But…how else do you function when you hear that you or someone you love has cancer? How do you let God comfort you? God allowed this to happen to you…why is it part of His plan for this person to have cancer? Cancer has been all around me lately and I can’t help up think, WHY GOD? I want to be very open and honest in what I am going to say next. I believe God has a plan…but I can’t see it right now. Why did a 7 year old have to battle cancer, chemo and radiation? Why does a daddy, husband, farmer, and man of God have to go back and forth to Dallas for treatment? WHY GOD? Why does MY daddy have to get cancer? What have they done in their lives to get cancer? All 3 of these people love God with all their hearts and follow Him DAILY…so why must they have cancer? God, I know you have a plan…but why can’t we see it? I know you are in control, but why does this have to happen? I believe God allows us to walk through storms in life so we can rejoice in Him later. He doesn’t ever show us His plan…because our human brains cannot comprehend it. When we feel like He has abandoned us…he is actually right next to us. When we feel like the world is crashing down around us…He is there to rescue us. When you go through deep waters, I will be with you. When you go through rivers of difficulty, you will not drown. “Do not be afraid, for I am with you. 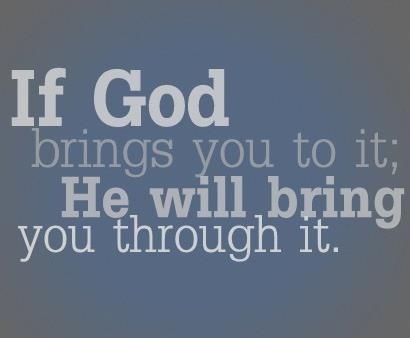 If God brings you TO it; HE will bring you THROUGH it! Cancer is tough, but we serve an even TOUGHER God. Cancer is big, but we serve a BIGGER God. Cancer is scary, but serve a COMFORTING God. These past few months have been absolutely crazy, which is the reason for my blogging break. In August, I married my bestfriend and started a full time teaching job. The wedding was absolutely perfect in every aspect! Luis and I were so blessed by the service and it was a wonderful day for us. After the wedding we went to Florida for a week. We had so much fun just being together and relaxing on the beach. When we returned to DFW, he went back to work and I had 2 weeks off before I began teaching full time. The week of the wedding I had gotten a full time teaching job and I was excited about it, however I was nervous. I would be teaching Elementary Library, Secondary Music, and Junior High Spanish. I graduated with a degree in Music so I had no clue what I was doing, but I knew God had a plan. I began school at the end of August and went in full swing. I would teach 22 classes a week and have over 350 students. About the middle of September, we found out we were pregnant with our first child. We did not plan having a child this soon, however God had a better plan. Our little girl will be born in April of 2013. We are so excited. Once we got over the shock and just rested in God we knew that this was what God had planned for us and we are excited. For me this pregnancy was God’s way of letting me know His plan is much better than my own. I have always planned everything out and when it does not go the way I had hoped, I get nervous and freak out a bit. God is teaching me slowly that He is in control and not me. I have truly learned to trust His plan these past few months. I am so thankful that I have had my wonderful husband through these past few months. Together we have faced many obstacles and are excited to welcome our baby girl in a few months. Through the obstacles and trials we have faced, we have not only gotten closer to each other, but we have truly trusted God in every step. Today if you are at a cross road, trust in Him. Even when you feel like things are crumbling around you, know God has you. God will never leave you nor forsake you. Trust in this truth today. Do you have an unanswered question in your life today? Are you waiting on God to reveal something in your life? Do you have something going on that you really just don’t understand? If you answered yes, I can relate. I have a few unanswered questions of my own. If you are like me, you know God has a plan, but sometimes trusting in His plan with unanswered questions is hard. When faced with unanswered questions, what is your first reaction? Is it to stress out and try to regain control of the situation? Is it to give up and say what happens happens? or Is it to pray? Now I wish my answer was to pray, but that is not always the case. God has been working with me to make praying my first option, and I am doing better. My question for you todaybis are you trusting at the beginning of an unanswered question? or Are you doing it on your own? Give you unanswered questions to God today. He knows exactly what is best for you. God is waiting with open arms to help you today. Trust Him. Whew…it has been a crazy past 2 days!! Yesterday (Monday) I began my Radioactive Iodine Uptake test. This was the test I had to do for my thyroid to see what was really going on. This is a two part test, given at three different times. The first time I went, they had to give me the radioactive pill. Not a huge deal, but since it was a radioactive pill, it had to be administered at the hospital. After taking the pill I was free to go. I got back to the dorm, washed my sheets, did homework and my friend colored my hair. I am working on going back to my natural color, so we are working on getting there. After coloring my hair, I jumped in the shower and got ready as fast as I could. I had to go back to do the actual test on my thyroid. During this part of the test, I had to sit completely still for about an hour so they could take pictures of my thyroid. I was strapped to a table and could not move. It was definitely an experience. After I left the hospital, I went to the chiropractor. When I finished at the chiropractor, I had dinner and spent the evening with my boyfriend. I ended the day reading “Jesus Calling” devotional and meditating on the Word. What a great way to end a very crazy day! Today, I woke up and had to be at the hospital to finish my Uptake test. After finishing it I had to go to Walmart for groceries! I cut up fresh fruit for lunch and enjoyed it! After eating lunch I completed my homework assignment and headed to my thyroid specialist appointment. After that appointment, I had to get back for a meeting about my upcoming student teaching. The meeting made me scared but yet excited, nervous but yet anticipating greatly! I found out all the rules and regulations that I must follow during the semester! I am so excited about the upcoming semester! After the meeting, I went to my night class. I had to sit in class tonight for 3 hours. I learned about classroom management and how to handle students when I get into my own classroom. I cannot wait to get my own classroom and be able to teach! Teaching is my passion and I LOVE kids! I cannot wait to teach kids and the crazy part for me is I actually get paid for doing something I love! I cannot believe I am so blessed! One little nugget I will leave you with tonight is: God knows exactly what He is doing in you. He knows exactly the purpose of everything going on in your life. It may not seem like it, but He is there watching over you. Keep going, keep walking, and trust in Him no matter what. A few nights ago there was a bad storm I was sitting up listening to the thunder and watching the lightening light up my room. As I was laying in bed, I began to think, what if I did not have shelter during the storm? What if I was stuck in the storm? Listening to the storm made me think of storms of this life. When storms of life come my way do I have shelter? or am I stuck out in the storm? Today I rest in the fact that I do have shelter from the storms of life. I know that God is my shelter, but do I always go to Him? Times in my life, when I have faced storms, the first thing that comes to mind is not to take shelter in God, which it should be, but the first thing I think of is how can I make the storm rest? How can I fix the situation? God reminded me that I cannot calm the storm, but I can rest in Him. Choosing to find shelter in the Lord and staying in that shelter no matter what the storm is will help strengthen the believers. Knowing that God has His perfect and mighty hand in each situation gives me peace. When facing a storm of life, PRAY. God says, in Isaiah 41:10, “Do not fear, for I am with you; do not anxiously look about you, for I am your God. I will strengthen you, surely I will help you, surely I will uphold you with My righteous hand.” He will hold you in HIS righteous hand! What else could we want? Sometimes praying seems like it does not work. I read one day, “Sometimes God calms the storm, sometimes He lets the storm rage and calms His child.” Sometimes the answer to your prayer is not exactly what you wanted, but God knows what He is doing and will not leave your side. The fact of the matter is God is standing there waiting for you to take refuge and shelter in Him. Storms of this life are hard, but when you have the best shelter, let the storm rage and rest in Him.